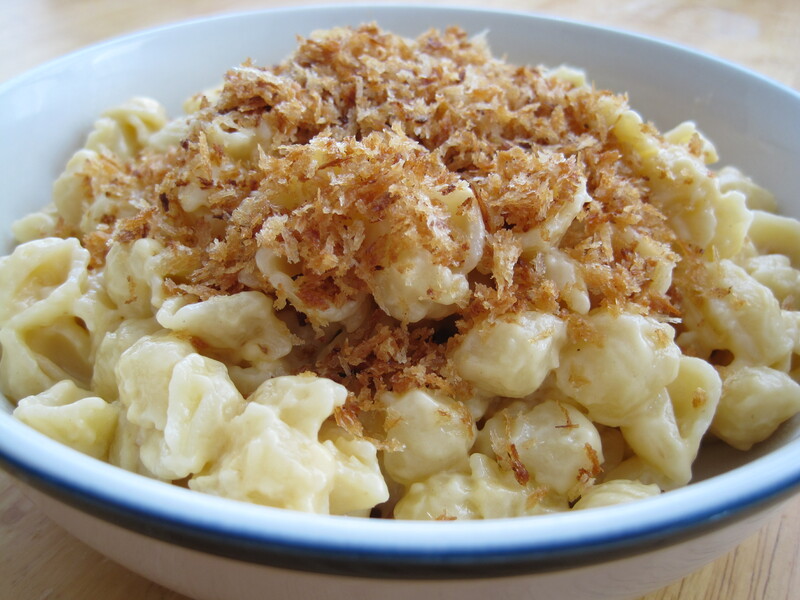 I gave up trying macaroni and cheese recipes years ago. I never made one that people didn’t like, but I never found one that I could enjoy. Recently, it occurred to me that maybe it’s because I don’t like what baking does to the texture of this dish. So I tested that theory and made a stove top macaroni and cheese for the first time. I liked it a lot more than baked macaroni. The macaroni and cheese recipe is pretty standard, but I made it better in two ways: The first was adding a crunchy panko crumb topping and the second was mixing in peas and canned tuna in olive oil. The texture and flavour of canned tuna in olive oil is by far superior to canned tuna in water, and makes a world of difference in this dish. If using the panko crumb topping, make it first and set aside. 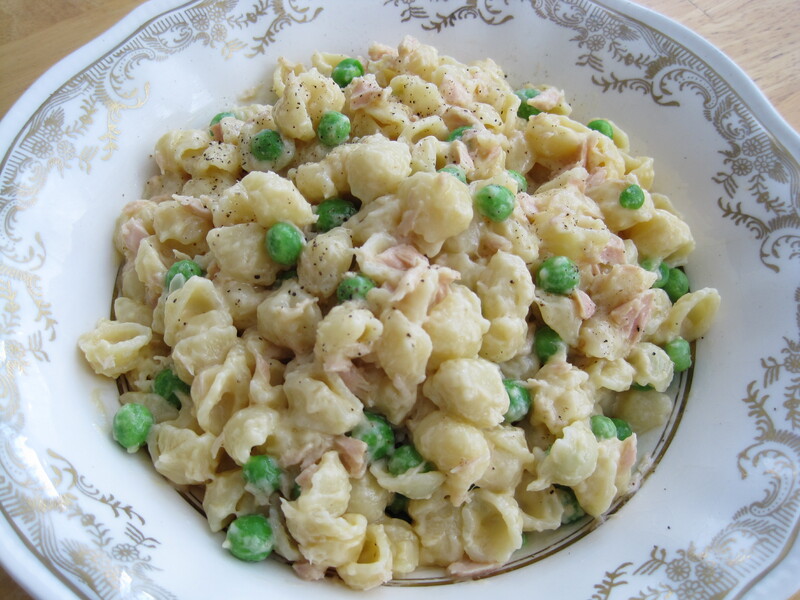 If using peas and tuna, flake the tuna (breaking up any large chunks) and set aside. Bring a large pot of water to boil. Salt generously and add the pasta. Cook until al dente as per the directions on the package. Meanwhile, in a large pot, melt the butter over medium heat. Cook the onion until soft and add the flour. Mix well and cook for 1 more minute. Then, while stirring constantly, add the cream gradually. When the mixture is smooth, simmer gently, stirring frequently, until the sauce thickens slightly. You want the sauce to be more runny than your desired consistency, because it will continue to thicken. Add the cheese and stir gently until it melts completely and your sauce is smooth. Drain the pasta and add it to the sauce. Add ground black pepper to taste. Mix to coat the pasta well and remove from heat. If serving with the panko crumb topping, dish out the pasta into bowls or plates and top with the crunchy bread crumbs. Serve immediately. Or, add the peas and flaked tuna, and mix gently to combine. Serve immediately. In a saute pan over medium low heat, melt the butter and add the panko crumbs. Mix well so that all of the crumbs are coated in butter. Heat the crumbs gently and stir occasionally until they are evenly brown and crunchy. Remove from heat and set aside. Once cool, store in an airtight container until ready to use.